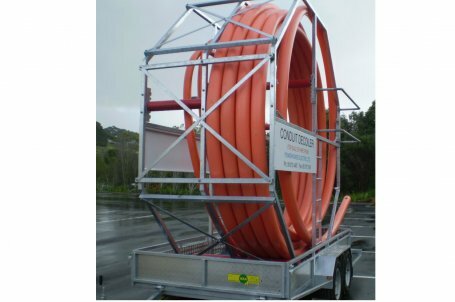 This is a tandem axle trailer with a cage mounted on it that has 2 conduit housings and can hold rolls of continuous conduit up to 150mm dia. The unit comes with a ladder and safety rail each side for access to the top adjustable rollers. The ladder is also handy for climbing up to fit or remove the lifting strop. The bottom and end rollers are both adjustable so it can easily hold different sizes of conduit. 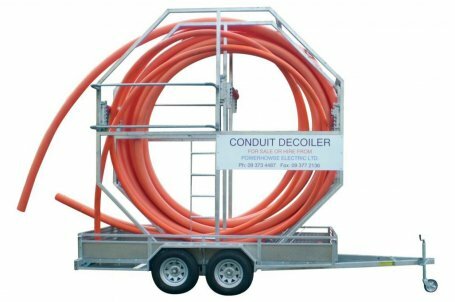 This unit will accept either 1 or 2 rolls of conduit and can hold 2 different sizes of conduit at the same time.